New Radware research is aiming to give Internet retailers a “shopper’s eye view” of how e-commerce sites perform on both desktops and mobile devices. The load balancing and DDoS protection solutions provider conducted two separate studies, titled “State of the Union: Ecommerce Page Speed & Web Performance, Fall 2014” and “2014 State of the Union: Mobile Ecommerce Performance.” Both studies include insights into 100 top retail websites, including factors that contribute top changes in Web speed. According to the studies’ findings, the median Web page is 19 percent larger than it was just one year ago. Moreover, 22 percent of sites took 10 or more seconds to become interactive while 2 percent took 20 seconds or longer. Additional findings show that although images make up 50 percent of the average page’s total weight, 35 percent of sites failed to compress images, which is a technique that can considerably reduce payload and streamline page rendering. When it comes to mobile, the data reveals that 81 percent of sites automatically serve an m-dot version of the homepage to smartphones. That said, 20 percent of m-dot sites don’t allow shoppers to access the full site. It is also important to note that the study shed light on tablets, finding that 8 percent of the top 100 retailers serve tablet-optimized versions of their sites. According to the data, the median load times varied across tablets, ranging from 5.7 seconds for the Galaxy Note to 8.1 seconds for the Nexus 7. 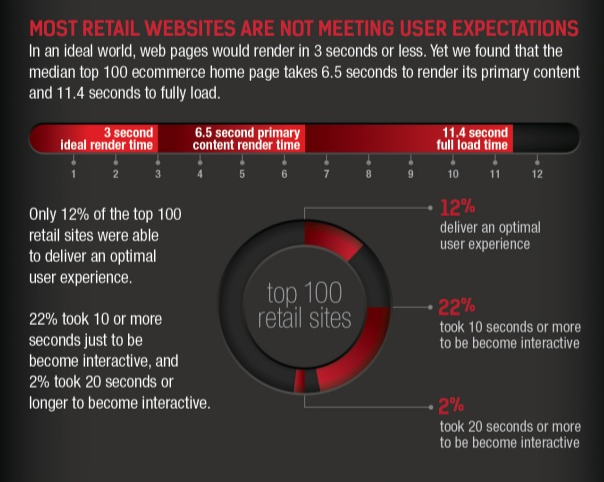 Radware also notes that the average shopper expects Web pages to render in less than 3 seconds. Unfortunately, the company’s studies show that retailers are coming up short, with data revealing that the median homepage on a desktop takes 6.5 seconds to render primary content and 11.4 seconds to fully load. Conversely, the median load time for m-dot pages on the iPhone5s is 4.8 seconds. In fact, the data shows that just 12 percent of the top 100 retail sites rendered feature content in fewer than 3 seconds on desktops, and 15 percent of full-site pages loaded in fewer than 4 seconds on the iPhone 5s. Lastly, Radware included some predictions for the upcoming holiday season in its reports. According to the company, retailers may want to experiment with geo-targeting campaigns to identify a shopper's location and serve specialized deals, content and product offerings. When it comes to mobile, however, Radware notes that retailers should focus on delivering a fast and consistent user experience across devices.